Straddling Europe and Asia across the Bosphorus Strait, Istanbul’s mish-mash of cultures is unique among the world’s cities. Here, in the midst of the shiny hotels and centuries-old architecture, European-style plazas combine perfectly with exotic spice bazaars, church spires stand side-by-side with Islamic minarets and, down on street level, the stimulating scent of coffee and shisha pipe fills the air. Istanbul’s two most famous sights are found in the Old City, or Sultanahmet, which centres around a square of the same name. Here, you can’t fail to spot the six sky-piercing minarets of the Blue Mosque, built in 1616 and still in use today. Just as impressive from the inside as from the outside, within its walls you’ll find exquisite ceramic tiling, stained-glass windows and a whole colour wheel of blue which, when combined with the chandeliers, lamps and colourful carpets, make for a dazzling spectacle. 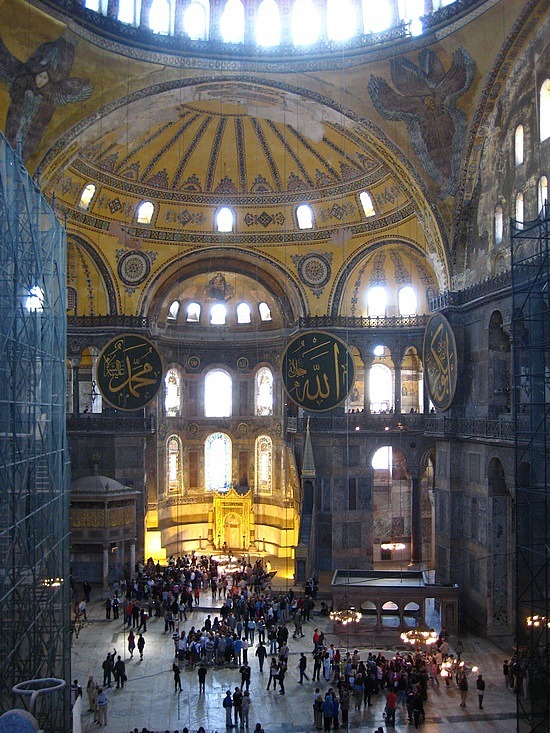 The other of those two famous sights I mentioned is this: the Hagia Sophia. Expecting it to be impressive, I had avoided looking at photos or googling it prior to visiting (quite a mean feat) and I wasn’t disappointed. Once a church, then a mosque and now a museum, but mostly resembling a mosque, the Hagia Sophia is known for its huge 30m-diameter dome and intricate mosaics depicting biblical scenes. 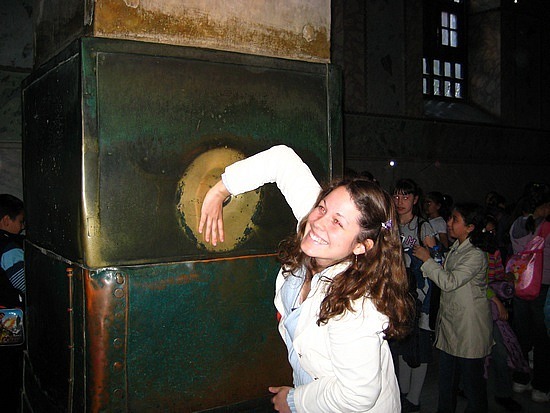 One of its pillars, known as the Wishing Column, contains a small hole in the bronze, where thousands of worshippers have poked their fingers over the centuries, slowly enlarging the hole. You can make a wish by inserting your thumb and moving your hand in a circle, so I queued up with lots of eager schoolchildren and had a go. 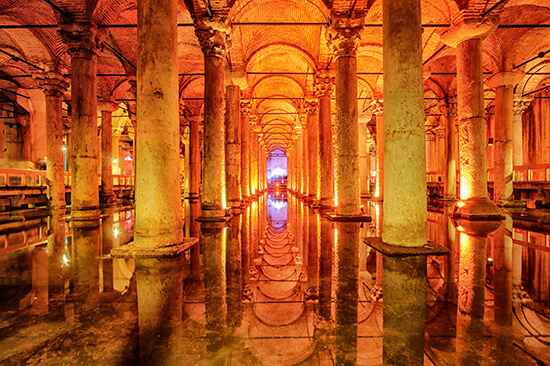 Fans of Dan Brown’s Inferno may be familiar with the Basilica Cistern, an underground reservoir built in 532AD to provide water to the city and its palaces. We stumbled across it by accident when we noticed people disappearing behind its unassuming doors and, curious as to where they were headed, decided to follow them beneath the city. It’s lit up and a little spooky down there, the many columns reflecting in the dark water, one of which features a strange upside-down Medusa head. No one quite knows why it’s there. 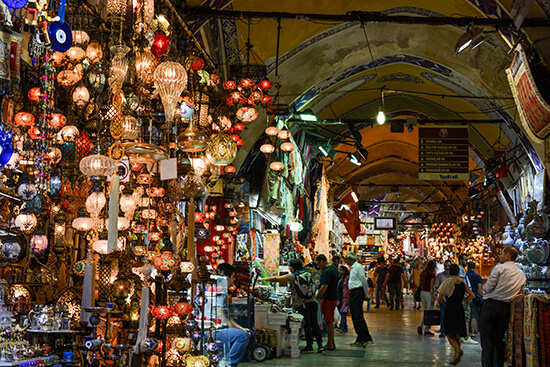 Spread over 61 covered streets, the Grand Bazaar is a treasure trove of over 4,000 stalls, selling everything under the sun, from perfume and rugs to ceramics and Turkish delight. At over 550 years old, it feels like stepping into a scene from Aladdin – all it needs is a magic carpet. On my visit, despite claiming I was ‘just looking’, I soon gave in to temptation and bought a colourful glass lantern. 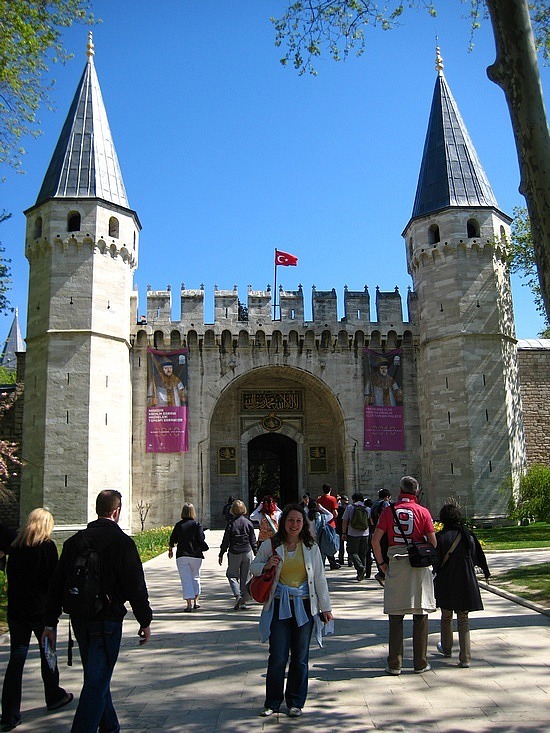 Once home to the Ottoman sultans, Topkapi Palace, just outside the city centre, is a masterpiece of opulent extravagance. Outside, its turrets and landscaped gardens, overlooking the Bosphorus, could be taken from a fairy-tale castle, but inside, the blue ceramic tiles, golden Arabic inscriptions and marble-clad bathrooms make this palace a far cry from any European castle I’ve ever seen (and I’ve seen a lot). Come to learn its history and admire the unadulterated opulence of it all. What better way to cross the Europe-Asia border than by boat? 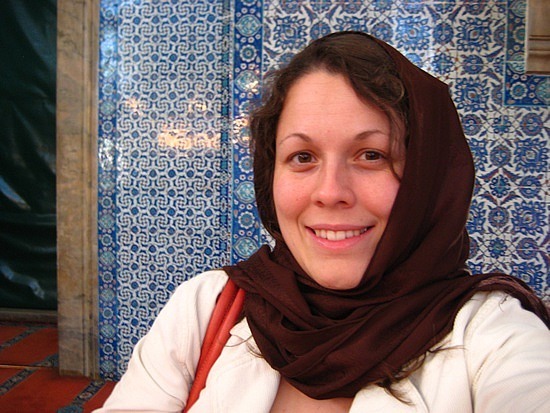 Of course you can use one of the bridges, but for me the relaxed, slower route on the water, with its fabulous view of the mosques and monuments as well as the outlying fishing villages, was the ideal way to take in the city. We disembarked for photos on both sides – two continents in one day! 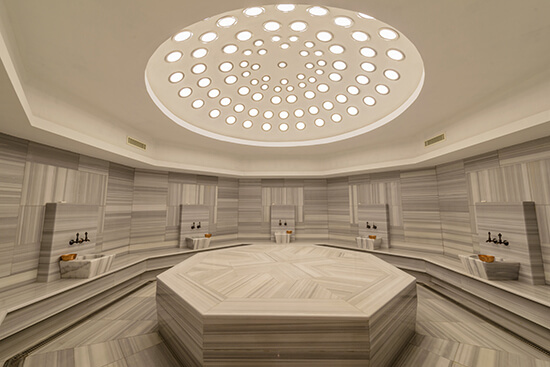 Despite not being one for massages and steam rooms, I had made up my mind before even touching down in Turkey that I wanted to try a hamam, or Turkish bath. I was in for a bit of a shock however, as I soon discovered that toplessness was obligatory. Although the sexes were split, I was feeling shy and tried to keep my bikini top on but my masseuse was having none of it. Still, once I realised that we were all in the same boat, and it was pretty steamy in there anyway, obscuring the view, I relaxed and enjoyed my skin scrub, wash and soak in the various pools. An hour later, I emerged, smooth-skinned and red-faced from the heat to find my boyfriend sitting outside feeding ice cream to a stray cat. Confession time! 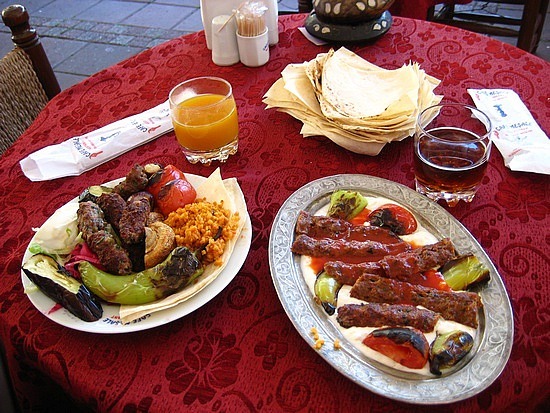 I had never eaten a kebab before I went to Istanbul; images of greasy late-night takeaways had put me right off. But in Istanbul, the kebabs, sometimes doner style (roasted on a spit), sometimes shish (small cubes of grilled meat), sometimes adana (minced meat) were out of this world. The meat was so tender, served with spiced yoghurts, hummus and pitta, and often accompanied by roasted vegetables or rice. I ate one every day for five days and never tasted the same thing twice. Try baklava, a super-sweet honey-soaked pastry for dessert. Istanbul has a decent public transport system, including buses, trams and a four-line underground network. Walking is a delightful way to take in the city, especially around Sultanahmet Square and, if you’re not in a hurry, travelling by boat is a good option too. Top tip: remember to cover your shoulders and knees and remove your shoes before entering any mosques or religious buildings. 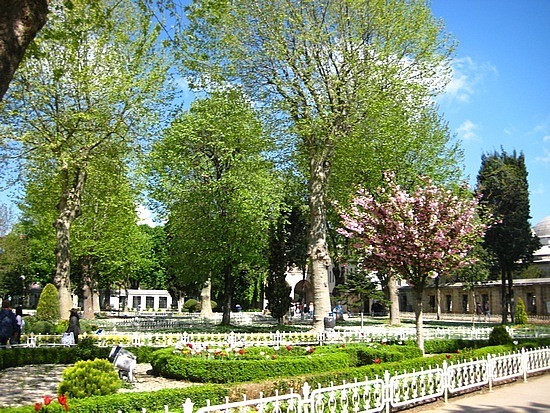 Although Istanbul can be visited all year round, spring and autumn are the best seasons. Visiting at these times avoids the hot and humid summer when temperatures hover around 30-40°C and the cold, sometimes snowy, winter. I visited in April, when the flowers were blooming, the sun was shining, the skies were blue and it wasn’t too hot – perfect for wandering around the sights in comfort. Ready to book your European city break? 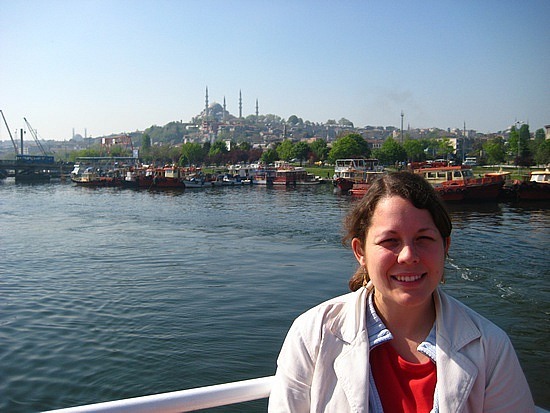 Make an appointment with one of our Travel Experts to start planning your trip to Istanbul.